A poorhouse accommodating up to forty paupers was set up in 1737 at a site between Long Street and St James' Green in Thirsk. The running of the establishment was contracted to an "undertaker" who maintained the inmates, but benefited from any income from their work which was mainly spinning. Conditions were squalid but the diet was wholesome and the regime humane. Other workhouses in the area included was one at Topcliffe dating from the 1760s, and another at Sowerby from the 1770s. North Riding of Yorkshire: Ainderby Quernhow, Bagby, Balk, Birdforth, Boltby, Carlton Miniott, Carthorpe, Catton, Cowsby, Dalton, Elmer [Eldmire] with Crakenhill, Fawdington, Felix Kirk, Holme, Howe, Hutton Sessay, Kepwick, Kilburn, North Kilvington, South Kilvington, Kirby Knowle, Kirby Wiske, Knayton with Brawith, Maunby, Newby Wiske, Newsham with Breckenbrough, Osgoodby, South Otterington, Pickhill with Roxby, Sand Hutton, Sessay, Sinderby, Skipton upon Swale, Sowerby, Sutton-under-Whitstone Cliffe, Thirkleby, Thirlby, Thirsk (2), Thornbrough, Thornton-le-Moor, Thornton-le-Street, Topcliffe, Upsall. Later Additions: Hood Grange (from 1858), Humberton (from 1895), Milby (from 1895). The population falling within the Union at the 1831 census had been 12,013 with parishes ranging in size from Howe (population 33) to Thirsk itself (2,835). The average annual poor-rate expenditure for the period 1834-36 had been £3,952 or 6s.7d. per head. Initially, the Thirsk Guardians considered retaining existing parish poorhouses, with able-bodied males and all the elderly and infirm going to Sowerby, and able-bodied females being placed in Thirsk. 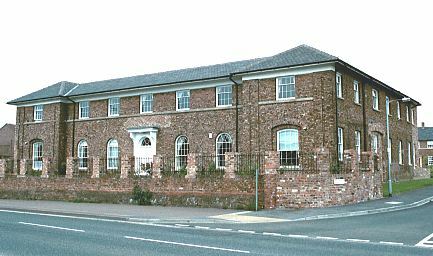 However, problems with adapting the old buildings led, in 1838, to the erection of a new Thirsk Union workhouse on the north side of Sutton Road in Thirsk. The Poor Law Commissioners authorized the expenditure of £2,200 on its construction which to accommodate 120 inmates. The building of the new workhouse provoked demonstrations against the New Poor Law. There were disturbances in the town in the summer of 1838 when a mob gathered and effigies were burnt. The building was completed and ready for use by January 1839. The central block was an almost square building, two storeys high, with two tiny courtyards at the centre. Following a measles outbreak in 1842, additions were made to the site including new reception, vagrants', fever, and convalescent wards. An infirmary was added at the north of the site in the 1850s or 1860s, then in 1886 a hospital for infectious cases was erected at the far north-east corner of the site. The location and layout of the site are shown on the 1912 map below. Thirsk main block from the south-east, 2001. Thirsk gained a reputation for being one of the best managed workhouses in the north, mostly due to the influence of the Guardians' vice-chairman Thomas Smith, a local draper and grocer, and a Quaker. Work given to male inmates included stone-breaking, and the grinding of corn using a handmill. Women performed domestic work or picked oakum. In 1847, Thirsk was one of the earliest Unions to appoint proper teachers. Thirsk from the north-west, 2001. After 1930, the building was inherited by the North Riding County Council but stayed empty until it was pressed into military and first-aid use during the Second World War. The site was later used as a "Poultry Rearing Station" and then as a factory. In 1998 the infirmary was demolished and the surviving main block was converted to residential use. North Yorkshire County Record Office, Malpas Road, Northallerton DL7 8TB. Limited holdings include: Guardians' minutes (1909-30); Boarding-out committee minutes (1915-30). Thirsk Workhouse by Dr P Hastings (1996, Ripon Museum Trust leaflet).